Have you ever considered the wonder of color–how a soft, pristine blue can calm and relax, how a vibrant, intense red can energize and motivate, or how a lush, welcoming shade of green can bring renewal or ideas of rebirth? Hunter has pondered these things and more his entire life… Here is his story. “When I was three years old, I started a journey that would impact the rest of my life…I began preschool. I had always been a very social person, so I was naturally excited to meet a classroom full of new friends. The thought of having 30 new people to laugh at my jokes, to race across the playground, to build tall block towers, and to learn with was so exciting to me. Let’s just say, preschool didn’t exactly unfold as I had planned. Learning my alphabet and numbers came with great ease–I even learned them faster than most of the other kids in my class, but I severely struggled when we started to learn patterns and colors. I remember being so frustrated with myself and embarrassed that I could never quite stumble on the correct answer. My parents spoke with my teacher on many occasions, and all became worried that maybe I had a learning deficiency. After many hours of thought and collaboration, my parents decided to have me tested to see if I could be color blind. I was very nervous the day I walked into the optometrist’s office. My mom assured me that the test would be painless, and I didn’t have to be scared. I was just so sad and embarrassed that something might be wrong with me though. My doctor pulled out a book, and he simply told me to identify the shape I saw in the picture. Unfortunately, I saw no shapes in the picture at all. I was indeed color blind. My mother and I left the doctor’s office with feelings of both concern and relief. I remember her telling me that I was just as smart as other children, and I did not need to get discouraged at school. This was easier said than done. When my friends and I played board games at recess, I often struggled to move my game piece to the right color square. They would naturally giggle as most young kids would do–these types of things happened all the time. Preschool finally started to unfold the way I had hoped on a very special day, career day. We all got to dress up as what we wanted to be when we grew up, and I chose an optometrist. When I stood before the class and talked about my costume, I explained to my friends that my optometrist was my hero. 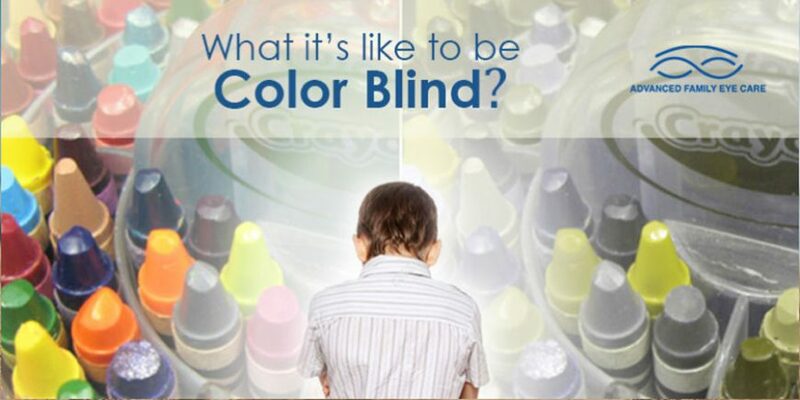 He had told me and my mother that I was color blind, and while he couldn’t fix my problem, he at least made me aware of my condition so I could learn to adjust. At that point, almost every hand raised in the classroom. All of my friends wanted to know what it was like and how I saw differently than them. It felt so great being the ‘cool kid’ at school.